Today you turn 14. Some years I am feeling nothing more than disbelief about each of your ages as it ticks by. But this one? It makes perfect sense to me. My love, at 14 you are everything you’ve always been: quick-witted, insightful, intelligent, independent, and determined. But now you are all of those amazing qualities in a taller version that surprises me at least half the time when you walk into a room. You like to refer to me as “Short stack”, which will only be a joke for another five minutes. Without a doubt, you’ll have surpassed me at this time next year, which will be great on the basketball court. Your sense of humor is outrageous. At your 8th grade graduation, the teachers shared that you were “hands down” the funniest member of your class, according to your peers. You made Nana and me laugh from one end of Montreal to the other in June with your fake French accent. You’ll start taking French this year in high school and we can’t wait until you can put some words to the accent. You often show up in my room at night when I’m ready for bed, and put on a one-man show until I kick you out so I can go to sleep and need to stop laughing. Lyle, thank you for bringing us your random improvisation, your determination in the gym and on the court, your humor, and your very sensitive heart. I appreciate your confident independence and ability to get yourself anywhere you want, as I know this will extend into your adult life. This week we’ll be bringing your big brother to college, and the following week you’ll start high school. I can’t wait to see what you do with the new opportunities and space being created all around you in the coming year. You know, I loved it when you were a baby. I used to tell anyone who would listen that I wanted to freeze you at whatever age you were, so that I could enjoy that stage for just a little longer. I remember someone thinking that was very strange when you were three months old. But I meant it. And then you were the sweetest little boy, with your big brown dreamy eyes and shy smile, hiding your face in my neck and holding onto me for dear life, basically all the time. But I’m glad I didn’t freeze you at three months, or age four, or even seven and a half. Because then I wouldn’t have you as a 13-year old today, and sweetie, who you are is magical. At 13 you are that complicated and delightful combination of young boy and teenager. In one long stream of words you tell me that you’re getting buff and that you are highly impressed with your own tan lines this summer, and then ask if I’ll be coming in to tuck you in soon. Of course, I say, smiling to myself, glad that such a buff child still wants a kiss good night, though I continually stub my toe in the dark on the hand weights you keep next to your bed. You are extremely independent and confident, navigating your way around this big city on your own. You get yourself to and from school on the CTA, and told me last week that you don’t want to take driver’s ed when you’re in high school, because what was the point? You’d never want a car when you can use public transportation to get everywhere. You had a dream recently in which you were taking the purple line downtown and you found that so strange because everyone knows the purple line goes to Evanston, not downtown, and I lost track of the rest of the dream because I couldn’t believe you were dreaming of CTA lines. On your free days in the summer you meet up with your pal Gabriel, friends since you were three years old, and the two of you have amazing adventures. Sometimes you take the El to get someplace in the neighborhood you could as easily walk to, and we do like to argue good-naturedly over that one. But the two of you will throw a basketball into a backpack and head off into the neighborhood on your bikes, looking for a free hoop wherever you can find it. You are all about basketball. And, as always, at 13 you are so very, very funny. Tonight as we were driving over to your birthday dinner, you glanced sidewise at my outfit and said seriously and with a hint of an eye roll in your voice, I didn’t even know you owned that dress – it’s like it came out of nowhere! Sweet boy, you are sensitive and loving and engaged in the world at all times and athletic and have more emotional intelligence than most adults. What a wonderful combination! 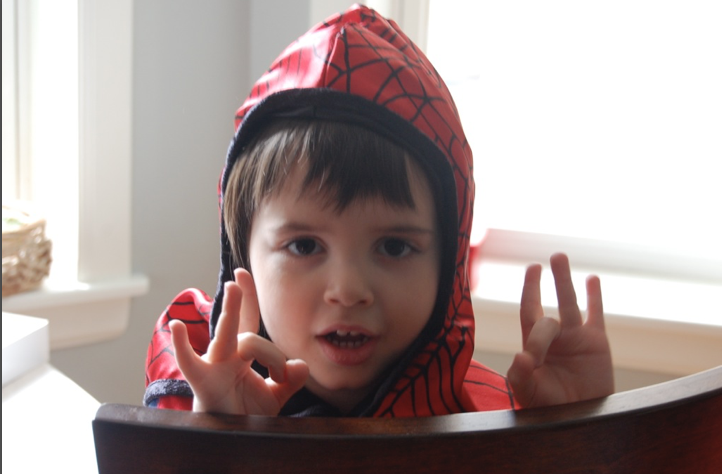 I am incredibly grateful to be your mother, and not only because you ask how my day was and actually listen. I cannot wait to see what this year holds for you. Now it suddenly seems I have another life, one that feels dramatically different in many ways from what came before the election, just two months ago. Now there is a poster in the front window of the apartment letting the world, or my little corner of it, know that “Hate Has No Home Here” and one on the dining room wall stating, among other very basic beliefs, that “Science is real” because now apparently that’s something we are driven to put in writing and declare to houseguests without a second thought as if it’s a radical act. Maybe next it’ll be “We breathe air” framed prettily in the kitchen and “The floor is below us” sprucing up the bedroom. Now I get up early to start reading the news and signing petitions, making phone calls, and sending emails, depending on the priority actions of the day. I’m strongly imploring those we put in office to oppose or continue to support, and when I read about a Member of Congress standing on the side of good or love or the poor or the sick or the disabled or female or in any way standing up loudly to those who are doing wrong, I find their social media sites and sign up to follow them, taking a moment to write: Thank you. Thank you. Now I’m thanking politicians I’ve never heard of, newspapers and reporters and TV anchors that I’ve never considered being grateful for, sometimes thanking them simply for being brave enough to say or publish a 3-letter word: lie. After a long day’s work, if the boys aren’t here, I come home to make a few more calls and read more news and then decide if I’ll be knitting more pussyhats for friends and family, or will I read one of the books piled high on my nightstand – maybe the Rebecca Solnit or Michelle Alexander or the 3-part John Lewis series or Howard Zinn. Books my tired news-reading eyes aren’t always up for at night, but that are calling to me. These are not the books that used to sit on my nightstand. Now when the kids are here we watch Selma on the weekend and listen to the WBEZ radio documentary The View from Room 205 in chapters over several dinners. I sign up for action meetings in hopes of finding a group that seems like a good fit. Our Christmas tree is still standing because I’d rather stay up to speed on the world around us than painstakingly take one ornament down after another and put the thing away. Soon, I tell myself. But there is a fight at hand and it feels a lot more important than any concern over prolonging Christmas into late January. Now we have a swirl of news day in and day out that feels nothing short of terrifying. We have a tantruming man-child of a fascist rather than a President and we find ourselves repeating to our children This is not normal, this does not happen in our country, over and over and over. But it is happening. It is a constant tornado of Sean Spicer’s lies for his boss and Kellyanne Conway’s alternative facts and the EPA and Rex Tillerson and De Vos with her grizzly bears and a fight over the size of inaugural crowds and rogue National Parks officials daring to tweet after an executive order and conservative legislators calling Women’s Marchers whiny and mentally ill and I keep looking at the source of news articles just praying even one will say TheOnion.com so that I can laugh, relieved, and yet it never does anymore and it just. keeps. coming. like one punch to the gut after another. It’s what passes for the news now, and it’s nothing less than surreal. And so of course now we Resist. Now we gather peacefully together and show each other, our President, and the world who we really are. I walk into the Chicago airport alone on a Saturday morning, with nothing more than a small purse stuffed with phone chargers, a toothbrush, and clean underwear, and hug strangers at the gate for our flight headed to D.C., one of whom puts her arm around me, crying, as random people at the gate photograph the whole lot of us, and fly myself across the country only to get out right into the middle of a crowd of over a million people to stand up and be counted and make my voice heard. A city I haven’t been to since I was six years old and had my father take pictures of me with a baby doll in our hotel room. But now I’m back and instead of taking smiling photos with a baby doll I chant and cry and sing and laugh with the pink-hatted strangers packed in tightly around me holding brilliant signs, and know that I could trust any one of these people to take care of me if I needed to, and realize that, in fact, I do need to and will for years to come. Now when the news is bad I am drawing some solace and energy from the experiences collected that day: the old women marching in wheelchairs, the men loudly claiming their feminist stances, the babies asleep on their mothers’ chests, the waves of cheering moving through the enormous crowd, the awesome young woman holding a sign that proclaimed It’s my bachelorette party and I can march if I want to, the young people energized like never before, the easy buddying up with others whenever needed, Madonna performing Express Yourself in a black pussyhat, the Chinese man who drives my Uber back to the airport who keeps saying, in broken English and in an awed tone, I have been here 10 years. I have never seen so many people before. And it seemed like…it was all mothers? I don’t correct him because I’m too tired and, well, I know what he means. The feeling of certainty that we are on the right side of history and we are not only fired up but also very ready to go. That simply being there I was communicating my strong values directly to my children. And of knowing, because we felt it in our own crowded bodies and heard the joyful noise and experienced it with our whole selves in ways that were both exhilarating and exhausting: there are enough of us and we can do this. This is not the end but only the beginning; it was the coming-out party for the Resistors, and it happened all over the world that day. Now I also find solace in an evening at home with my own children. With a teenager who follows the news and wants to talk about what’s going on, who can laugh at the most wicked memes with me and share in my shock at the day’s events, and then play me the awesome music he helped mix in the sound engineering studio at his public school. And with a middle schooler who wants to learn to make the turkey tacos so that next Tuesday he can get them started while I’m on my way home from work, and who chats and catches me up on his life of the last five days while we cook the simple meal together. Now we remind ourselves that this truly is a marathon, not a sprint. And while we can’t afford to look away or bury our heads in the sand for even a day, we will need to pace ourselves, knowing that if we pause to talk to the children and listen to their music and make dinner together, and yes, maybe even put that Christmas tree away before Valentine’s Day, one of those other joyful noisemakers – one of those women or men who put themselves in the same place we did last Saturday, standing shoulder to shoulder with us in body or in spirit – can be trusted to take care of those calls and petitions tonight. There will be more to do tomorrow. But now we rest. One day you wake up to find that your adorable little guy has become an adorable big guy – one who still wears braces but has begun to trade his signature glasses in for contacts. And sometimes, when 16 is hanging out with his friends, he might just have a llama on his head. For, as the kids say, Reasons. We don’t need to know more than that. It’s better that way. It turns out that 16 is a junior in high school. Let that sink in for a moment: junior. In high school. And he’s wicked smart and funny and oh-so-quick with the wit. 16 makes his mother hoot with laughter on the regular, especially when he catches her saying something lame and repeats it, following it up with, “– Jordan Sadler, 2016, Ladies and Gentlemen”. 16 is in his room a lot less these days, but that’s mostly because he’s out somewhere with his friends, riding in shopping carts and god knows what other shenanigans. When you come home from work in the midst of 16’s birthday celebration, you will be greeted with the Hamilton soundtrack blasting, noisy kids hollering to each other, empty chip bags, and several games strewn around the house, abandoned in favor of singing and dancing. The days with 16 at home are starting to feel numbered. Another year and a half of seeing his adorable face day in and day out, and then off he’ll go. But these days are even more fun than any others that came before them (impossible! you say, but no – it’s true), and you soak them up like crazycakes. It’s not an easy time in the world, but 16’s light shines bright, leaving the rest in the shadows, which makes me the lucky one. Happy Birthday, sweet Baxter. I love you to the moon and back! It seems that now you are 12. Holy cow. What does that mean for you? For starters, 12 is big. Tall. With long legs that seemed to stretch all summer long; in fact, you felt them growing. I wonder if you’ll remember that. 12 is – like ages one through eleven before it – hilariously funny. I often say you were put on this earth to make me laugh every single day. You’re outrageous, or – as your Great-Grandma DB once exclaimed happily after sitting next to you at a meal – you’re a three-ring circus! 12 likes to sleep in my big bed on hot summer nights when the air conditioner is on, and say random things that make me laugh and laugh until I have to tell you to stop once and for all and go to sleep so that I, too, can sleep. 12 is always up for a back rub and a snuggle, and I’m happy to oblige, knowing all too well that a new season of development is just around the corner. 12 likes a challenge – novelty! Anything new is interesting and bears online research, much discussion, and learning more about. I love the curiosity you hold at age 12. On Tuesday your new math teacher taught you a math trick with dice, and the next thing I knew you were off researching dice and card tricks in your room and running out to demonstrate them. Before they were quite learned, mind you. Imagine this only looks like one card, you begin, clearly holding a whole stack of cards. It’s a lucky thing I have a good imagination. This morning I had to ask you to pause your new tricks so that you could eat breakfast. Last weekend we made a pact at your request, promising that if either of us invented time travel in the future, we’d come back to that exact instant. You were eating pizza and grapes for lunch, and I was folding laundry. It seemed as good a moment as any to return to, and so I agreed. You began to glance furtively around the apartment, hoping, I then realized, that either your clone or mine would appear from the future to join us. I found myself hoping along with you. But above all, what is new and different about this moment is that 12 is so very independent. 12 takes public transportation with ease and walked to a local park with a friend to swim last week. 12 has begun to go off into the neighborhood on solo adventures. I’m heading out for a bike ride, 12 declares after dinner, stuffing his keys and mobile phone into his shorts pockets. I’ll be back before dark. 12 grabs a basketball and calls out, I’m going to shoot hoops at the park! See you in an hour! This is an absolutely lovely moment in time with you. You are on the cusp of even more wonderful changes as you begin 7th grade, and I am so grateful to be along on this ride with you. If I invent time travel in the future, I will welcome the chance to come back to visit you in this moment again and again. I’ll bring the deck of cards and a bike helmet. I love you, sweetheart! Happy Birthday from the bottom of my heart. I think you jumped straight from age 9 to 15 but I’m not sure. Somewhere in the middle you got that expander and had super awesome buck teeth and I took a lot of photos because oh! those buck teeth! So fabulous. All I know really about the passage of time is that you shot up 4 inches in the past year and you are this 6 foot giant of a reed thin boy who is going to take Driver’s Ed in the spring and so it has to have gone by really fast. And, as I’ve learned will always be true, you are only becoming more yourself as you get older. You’re that baby and that three year old [god help me] and that six year old and the nine year old and everything in between, just taller and wiser and funnier and even more handsome because there are no more buck teeth plus you have all that great hair and awesome glasses. I love to hear you sing weird songs and talk about Magic the Gathering. Laughing with you while watching the Republican debate last week was hilarious and gave me hope for the future of the country. Thanks for always knowing how to unabashedly be yourself, for wearing a Pikachu hat to high school, and for always being cool without worrying for one second about being Cool. We could all learn a thing or two from you, Sweetie. Once upon a time there were two little boys. So little. They became friends at age two, when their parents and I would do child care swaps, taking turns hosting a playdate before nursery school so that each week at least one parent had a few extra hours to get errands done or maybe just breathe. Neither of the boys could properly pronounce each other’s parents’ names, and sometimes they even forgot each other’s names, if we’re being honest. I remember giving out sticker incentives as they learned to pull on their own snow pants, hats, and tiny mittens, and striving to make a grilled cheese sandwich that would pass muster with a 3-year old who liked his mama’s sandwiches better and wasn’t afraid to say so. And boy, did they have fun together. Playing with trucks and trains and big blocks, and on the rare occasion getting into a tiny bit of mischief. I can still see the two of them looking at me with huge innocent doe eyes, sitting under a table and shaking their heads earnestly, convincing me that they were of course not peeling all of Baxter’s Pokemon stickers from his treasured sticker book and dropping them one by one into the heating vent in the floor. What fun that must’ve been! Several years later, after sadly leaving another awesome play date, one declared that he was “born to play” with the other. In our new apartment, the boys live a short distance from each other. 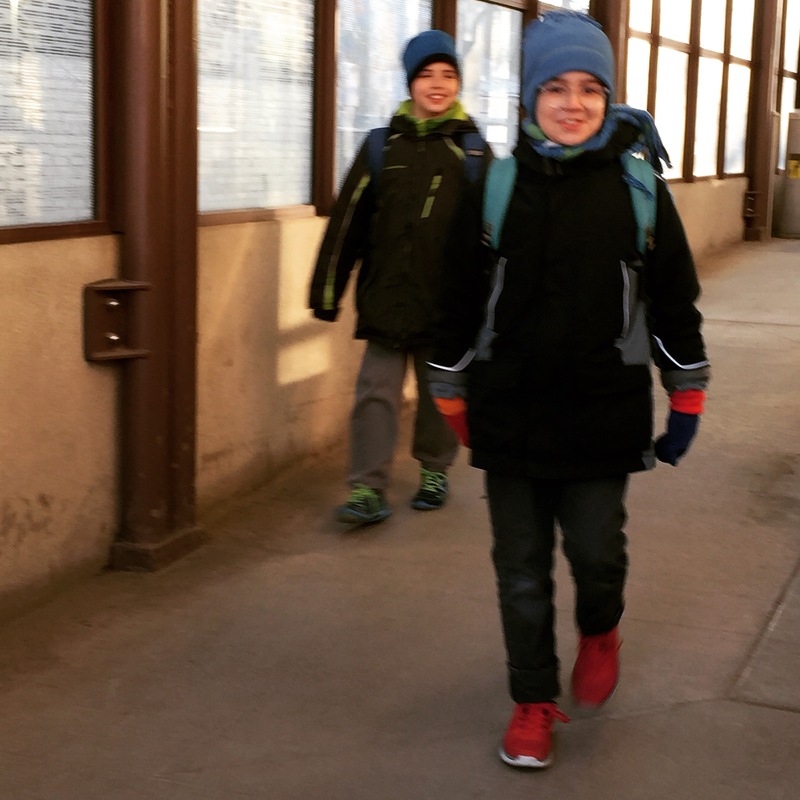 They are big and responsible enough to take the El home after school together once a week without a grown-up, 10-year olds on a grand urban adventure. They head to one apartment or the other to eat a snack and play Wii, laughing and chatting for hours. I think they would still say they were born to play together. There are parenting moments that go by so quickly you’d never believe it. One moment you are doling out colorful star stickers to tiny boys working so hard to put on their own mittens – oh, those awful thumb holes! – and in the blink of an eye you are looking at the same boys smiling broadly as they walk through a train station turnstile together after school and although you can just barely still see their baby faces in those expressions, you know you always will.